Our image for this week (two of them actually) come from J. A. Hammerton’s encyclopedic People of All Nations (volume 5, circa 1920). I don’t normally condone cutting up of old books. I had actually attempted to buy just the bottom picture in an on-line auction, thinking I was getting an original postcard or photo. Alas it was not the case. 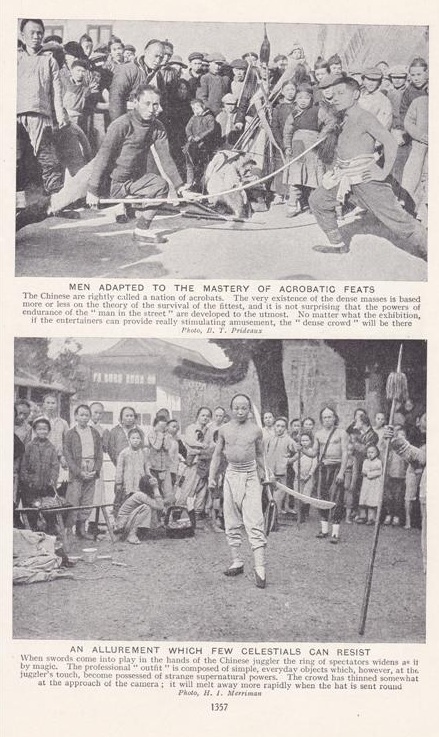 When thinking about the emergence of modern Chinese martial culture I often speak about the “martial arts marketplace.” I use the phrase as a metaphor for the subaltern space within Chinese society where hand combat ideas and philosophies competed for an audience, legitimacy and paying students in China in the 1920s and 1930s. Still, it is worth remembering that there is a much older, and more concrete, association between martial artists and marketplaces. Market days and temple festivals were times when large numbers of potential consumers came together in a single place. More importantly, the peasants had just sold their produce and were walking around with money. That made these gatherings a good venue for popular entertainment. Common forms included storytellers, puppet shows, opera performances, acrobats, traveling patent medicine sales demonstrations and martial artists. The martial arts were much more popular in the country side than in urban areas (with a couple of notable exceptions), and martial culture could easily suffuse all of these forms of entertainment. Story tellers might recite the exploits of the great heroes from Water Margin, puppet shows would portray “Monkey” fighting various monsters with his magical staff, and I recently saw an estimate that up to 1/3 of all of the plays in the traditional repertoire of Cantonese Opera troupes were probably stories of adventure and daring do that focused on the exploits of famous martial artists. These often features extended fight scenes. In fact, opera troupes quite literally competed with one another to offer the most impressive martial displays and showcase the most exotic styles. And then there were the straight up martial artists. These seem to have come in three varieties. There were local martial arts masters who put on displays, organized classes and recruited students at these events. This sort of market organization was a major force in the growth of Plum Blossom and other styles in Shandong and northern China. Secondly there were traveling bands of performers who attracted a crowd with their displays of strength, dexterity and hard Qi. The resulting crowd was then plied with patent medicines, charms or cheap martial arts manuals. At the end of the day the performers pulled up stakes and moved on to the next town. Lastly there were the “lei tai” fighters. A lei tai was a raised platform that would be erected so that a large audience could (for a small fee) watch a fight. Professional fighters would come into town and set up the stage. They would usually begin by issuing an open challenge to local fighters, and they would continue to perform for as long as they kept winning. And the longer they performed the larger and more animated the crowd became. Needless to say, big crowds were good for business. There is a lot of loose talk and gossip about the “good old days” of lei tai fighting that still circulates in martial arts circles today. Having a great grand-master who killed a man in a lei tai fight is seen (for some inexplicable reason) as the ultimate proof of the superiority of ones style. I do not mean to disrespect anyone’s style or creation mythology, but such stories need to be approached with extreme caution. Martial arts demonstrations could exist only when they were not seen as a threat to law and order by the government. In practice that meant they were a lot more common in the countryside where there were fewer officials and it was easier for a snake-oil salesman to ply his wares. Yet some of this stuff was seen everywhere and you always had to be careful not to let it go to far. Why? Because if the local government decided that you were a trouble causer or were “disturbing the peace” the typical punishment was to literally stake the offender to the ground, strip them naked and them beat them with switches until they bled. If you killed someone in a fight, justified or not, the typical response was a short trial and a public beheading, also conducted in the market place. 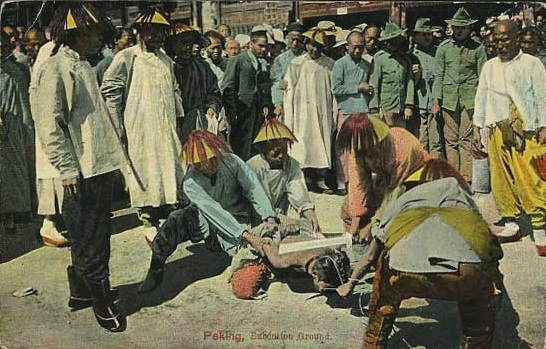 Public execution photographed for a Qing era postcard, hand-tinted. Postcards such as this one are relatively common and reflect the raciest bias of western consumers in the early 20th century who saw the Chinese as implacably violent, subversive and threatening. Unfortunately they also accurately reflect the swift and brutal nature of justice in late imperial China. Public executions were often used to deal with market thieves. As brutal as this sounds, the truth is, the government had its reasons for taking a very dim of highly publicized violence. If a leit tai fighter from one village were to kill a fighter from a neighboring village who was a member of a different clan, the result could be a spiral of revenge attacks and and score-settling that would escalate into a mini-civil war. No one wanted to see an outbreak of organized community violence, and stuff like this did happen. You also have to think about the lei tai fighters (and later western boxers and wrestlers) who became involved in this sort of thing. These people made a living doing this, and if they didn’t fight, their ability to continue to eat was jeopardized. They had no health or disability insurance. They had to travel far from home and their support network to ply their trade. And lets just say that turn of the century health care in the Chinese countryside left something to be desired. People wanted to attract a crowd, and they wanted to fight, but no one wanted to get hurt. It should not then be a shock to discover that not all of these fights were “on the level.” The higher the profile of the fighters, the greater the chance that the matches were fixed. Add a healthy dose of illegal gambling to all of this…and it should all sound very familiar. Before long Russian and European fighters were traveling to China and getting in on the game. These guys traveled internationally as part of their profession, so what really happened was that China was added as one more stop on the pro circuit. This won’t come as a surprise to anyone who is familiar with the popular martial arts mythology. It seems that half of all of the Kung Fu movies made today tell one side of this story. A foreign boxer comes to town, insults the fighting ability of the local peasants, whips the population into such a frenzy that everyone is willing to pay two bits to see him get his comeuppance. Next a mysterious stranger shows up. It turns out that he is a martial arts master who has heard of the problem and he then proceeds to clean the mat with the a fore mentioned foreigner. The town celebrates, local honor is restored and the managers of the two fighters split the revenue 50/50, usually after paying the local officials to look the other way. Everyone agrees to do this again in six months when they get together again in Shanghai or Malaysia or Hong Kong. In truth this sort of activity had a lot more in common with professional wrestling than professional boxing. On the odd chance that someone showed up to fight who didn’t get the memo the professionals would just move on to the next town in the middle of the night and try it again. Again, this was first and foremost a type of entertainment. It was wildly popular and lucrative. It stirred up a lot of local passion, but it was entertainment, not private war. Now this is not to say that all challenge matches were faked. At the local level you actually did have something that looked more like professional boxing. Certainly legitimate lei tai matches did happen, and fighters were injured, but a fair amount of discernment is needed when dealing with much later retellings of these stories. Whenever stories of multiple dead fighters start to be thrown around (especially if one of them happens to be a once famous European whose name has been lost to history) its time to become very suspicious. Back to our two pictures. The picture on the bottom is the more interesting so I will start there. Here we have a pre-1912 revolution marketplace and three martial artists (probably a teacher and two students) carrying swords and spears. The central figure is displaying an ox-tail dao, a type of sword that was never used by the Chinese military (at least no officially) but was favored by civilian martial artists. Both of his swords have a nice elegant sweep to them. The two assistants are carrying spears, and you get a great detailed shot of one of them in the fore ground. This is a heavily shafted weapon that tappers as you approach the tip. The spearhead itself looks small and sharp. It makes a nice contrast with the picture above. The spear being used by the central figures in their display of hard-chi is obviously very supple and skinny compared to the weapons being carried by the martial artists bellow them. There is a stack of other weapons in the background including a spear, a flail and a couple of long handled choppers (its hard to tell from the pictures exactly what sort they are). The publication does not list exact dates or places for either picture, which is unfortunate. I notice that in the top picture about half of the crowd is wearing ques and the other half isn’t. Take that for what you will. Judging by the style of cloths and dress I would guess that this photon was taken closer to 1910 than 1920. Given that the vast majority of individuals in China never studied hand combat, marketplace displays like this (or opera performances) would have been the closest that most people ever came to them. Its also worth reminding ourselves that these performers were not held in great esteem. They were quite literally the social equivalents of vagrants or prostitutes. In fact, opera singers and their children, like prostitutes, were even prohibited by law from taking the civil service exam, the one great avenue for social advancement that the state offered. Even if they managed not to hurt anyone in their demonstrations or challenge matches, getting hassled by the authorities (and being scorned by the better parts of Chinese society) was their daily lot in life. And that brings me to this (you knew I had to mention Wing Chun). When I was little, I used to see people doing martial art demonstrations in the streets. When they were finished, they would sell Chinese medicine to you. These people would travel from province to province and in this way, they would make their living. I never imagined, that when I got older, that I would be doing a similar thing. Instead of showing my martial art skill in the street, I teach seminars on Wing Chun Kung Fu. In an interview titled “Fifteen Years – Traveling the World to Sell My Skills” (Qi Magazine, March/April 2000, issue 48 pp. 26-28) Ip Chun candidly discussed the fact that while he is a famous martial arts teacher he doesn’t really like the martial arts. As a matter of fact, he actively dislikes them. He would much rather be doing something socially respectable with his time, and as he has got older the rigors of constant travel were starting to take a toll on him. He continues in the profession out of a sense of respect and obligation to his father, the much more famous Ip Man. Its all very Confucian. To better illustrate the deep irony of his situation he mentioned his distaste as a child when he and his upper-class father came across martial artists selling their skills in the market place. Now, all these years later, he finds himself in an oddly similar situation. Sure he is paid better and the police don’t hassle him. But its still not respectable or fun. This just goes to show that you cannot be too careful of the judgements that you place on others. Their fate may be your own!